Home The Wainwrights in Colour Not such a Happy New Year. 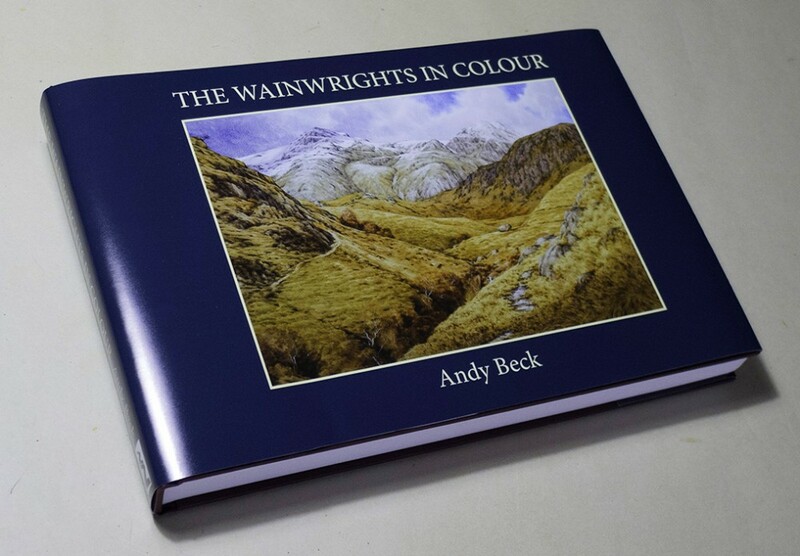 I suppose everyone wants to start a new year being positive and looking forward to what lies ahead, so it was for me, as we moved into January I was very upbeat, the sketches were nearly all compete for the Wainwrights in Colour project and the book was all but done. Sadly however for me things didn’t work out as planned. Just after the start to the year my 86 year old mother was diagnosed with a terminal illness and sadly she passed away within a matter of weeks. Thankfully she didn’t suffer for too long and she is now at peace. Due to this bereavement I not only stayed away from social media and also from posting here on my websites. I must thank all of you who contacted me to send their condolences, they were very much appreciated during this difficult time. Consequently I have to admit that during these initial weeks of the year my mind was elsewhere and my heart was not really into my work. I did however carry on with editing the book even though I was not able to concentrate on any painting at all which is unusual for me. However, during this past week things are getting back to normal but understandably this has set back the publication of the book by a few weeks but I hope that all those who have been waiting patiently for its launch will forgive me for this extra delay. In the meantime I have been adding extra detail to the pages of the book and tightening up the design and layout of the pages. Wainwright himself developed the look of the Pictorial Guides over their production (some explanation of which I have included within my volume) and by going down the self publishing route like AW I have the freedom to produce a book that I think compliments not only my sketches but also pays homage to Wainwright’s original works. Those original guides were exactly to his design and layout, he had a reason to place each sketch on a page and at the size that he felt was suitable. Even though I am using a computer program to place my images and text on each page I would like to think that the end result will, like the Pictorial Guides, be seen as one persons dedicated work and not a product of an editors ideas. It is a little know fact that early on when AW was formulating the Pictorial Guides that he considered producing the book as a Limited Edition run and idea which he thankfully dropped but I will carry on with my plan to produce just a single run of 5000 copies . I am pleased to say that due to the interest in my book about 20% of the print run has already been allocated to those who have sent me their details via email, and this is prior to any media promotion. Self-publishing is a huge gamble but hopefully I will not be left with a huge pile of unsold books under my bed. Sorry to hear of your loss Andy. Waiting patiently for the release of your book. Take care mate. I have been thinking of you Andy and I’m so sorry about your mum. I hope starting to focus on the book again will help you get through this difficult time – I’m glad you took time out when you needed it, take care and we are both looking forward to the book when it’s ready – but no rush! Many thanks for your kind comment. I am now back in full flow thankfully. Glad you had a great time up in the Cairngorms. Been thinking of you Andy and hows things are at this moment. Many thanks for the update, and hope we can meet up soon. Many thanks for your kind words. Yes, we should meet up soon but my walking days are restricted at the moment until I get the book to the printers then I will have a nervous and tense couple of weeks wait until the actual launch weekend so that may be a good time to get out. Speak soon. Hello Andy, sorry to hear about your Mam. I hadn’t heard until now. Condolences from Lyn and I to you both. We are over the Lakes next Friday so I will see if we can pop in on the way. Hi Ray, Thank you for your kind thoughts. Just let me know when you plan to be passing. look forward to seeing you. Hi Andy, I’m sorry about your loss – I just thought you were up to your eyes in the book; talking of which, I love the blue on the jacket. The inside text, too, is looking good. Thanks Clive. Working on the book was put on the back burner for most of January but back on track now.